The summit meeting of the heads of state of the Gas Exporting Countries Forum (GECF) was held in the Iranian capital, Tehran, as a result of which Tehran turned into a hub for delineating the future road map of the global gas industry. This was made possible due to the presence in the summit of high-ranking officials from 18 member states, including 12 main and six observer members. Natural gas, as the cleanest form of fossil fuels, is currently accounting for 25 percent of the global fuel basket. However, current estimates show that due to its low risk of pollution, this fuel will see the most rapid growth in consumption among other forms of fossil fuels, including crude oil. On the other hand, due to possessing 42 percent of the world’s natural gas production and accounting for 67 percent of the world’s natural gas reserves, 38 percent of gas transfer through pipeline and 85 percent of global gas trade in the form of liquefied natural gas (LNG), the member states of the GECF can be considered as the world’s unrivaled gas power. 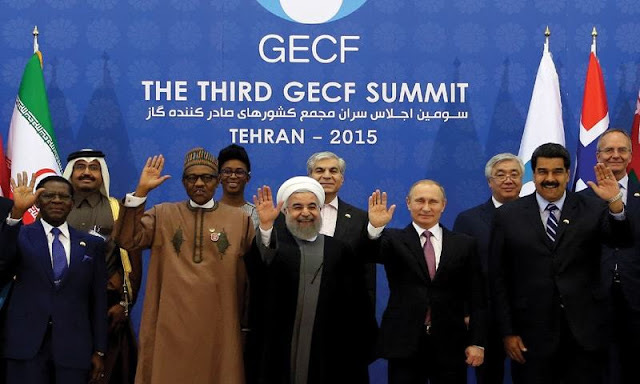 In the meantime, about 44 percent of global gas reserves and more than half of the gas reserves of the GECF is under control of two member states of the Forum, that is, Iran and Russia. The two countries have established a strong alliance as a result of efforts they have made to strengthen their strategic relations, and a recent two-hour meeting between the Leader of Iran's Islamic Revolution Ayatollah Seyyed Ali Khamenei and the Russian President Vladimir Putin in Tehran was a good evidence to this fact. The strong alliance between these two countries can be also of value to the entire GECF and on its own can reduce the weight of countries that oppose this alliance, including Arab countries like Qatar and the United Arab Emirates, both members of the GECF, thus preventing the bitter experience of the Organization of the Petroleum Exporting Countries (OPEC). In addition, in order to boost its own impact, the GECF needs to put up a more serious presence in important global challenges related to natural gas economy. Two serious challenges that face the global gas market include the issue of pricing and development of gas industry. The natural gas industry is currently being challenged by a new rival in the form of shale gas from the United States. At the same time, global goals and the international consensus reached at the level of all world bodies to fight air pollution and reduce greenhouse gas emission show that natural gas plays an important role not merely as a source of income for countries possessing natural gas reserves, but also as a serious option for the reduction of air pollution across the globe. And in doing this, the world needs those countries that are in possession of abundant gas reserves. On the other hand, pricing of natural gas is also faced with a serious challenge. Of course, setting a price for this product cannot follow a similar trend all across the world due to its special characteristics, including limitations facing gas transfer, the regional nature of gas markets and also the need to take advantage of pipelines in order to transfer gas, all of which require gas-rich countries to get the cooperation of their neighbors in this regard. On the other hand, due to the growing production of LNG, which can be transferred in the same way as crude oil, dependence of gas price on oil price, the impact of wide fluctuations in oil price on gas market, and also because of the fact that gas will overtake oil in terms of global consumption in the near future, gas exporting countries must make efforts to come up with new formulas for setting the price of natural gas. This is why the final statement of the GECF summit in Tehran not only underlined the existing risks that emanate from the current gas pricing method, which is based on the global oil price, but also emphasized the need to achieve a fair and logical price for natural gas. The secretariat of the Forum has also formulated a global gas model, which provides member countries’ ministers with medium- and long-term perspectives of the world’s gas market, including forecasts on price and demand and other issues that can provide the needed ground for policymaking and planning. In this way, gas, as the main option for fighting air pollution, and the gas market, which is continuously progressing in economic terms, both need an international institution to play a more serious role in order to safeguard the interests of those countries that possess rich natural gas reserves. And this must be done at a time that various forms of energy, including gas, are considered major sources of power for countries that possess them due to the bright future for their consumption. This issue has been already proven in the political faceoff between Russia and the West, in which it became clear to what extent Russia can bank on its gas reserves as a reliable weapon in the face of pressures that are exerted on the country by the West. The increasing need of such countries, including the European ones, to gas reserve that abound in Southwest Asia and Central Asia, shows that the inhabitants of the Green Continent must take one point into consideration in their political relations with countries in these regions, including Iran, which is now one of the world’s two main gas powers. They must know that if they want to mount political pressures on Iran and take advantage of such economic tools as sanctions to achieve their political goals, Iran will be also able to use gas against them as a tool, which will become more of a political power tool in future than it is now. The direct threat posed by the Leader of the Islamic Revolution about imposing gas sanctions on Europe, in view of the future prospect of Iran's gas production, which is expected to hit 1,000 million cubic meters in the next two years, on the one hand, and increasing willingness of the inhabitants of the Green Continent to import gas from Iran, which has been evident in consultations that took place in recent months during visits by European trade delegations to Iran, on the other hand, prove that the issue of natural gas goes far beyond pure economy and economic benefits. In the near future, the natural gas will turn into a political and strategic power tool for countries that possess its reserves and Iran must not stay away from developments that will take place in the global gas market.